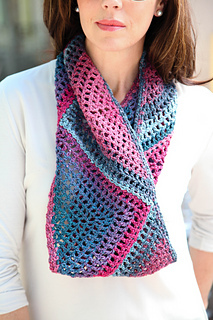 This quick one-skein project highlights color-changing yarn for dramatic angled stripes. It’s constructed with six simple motifs that are joined as you go. 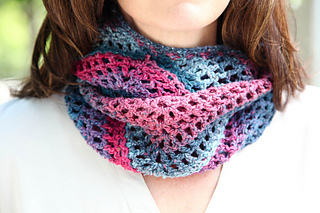 A simple edging completes the cowl and make the most of a single skein. Gauge: First five rows worked measures about 6” wide on longest edge by 3” tall. Blocked and laid flat, finished pieces measures 39” in circumference and 8” wide.